Sometimes I feel like I was born in the wrong country. You see, I really think I should have been Italian. I loveeeeeeeeeeeeeeeee pasta and always have, I picked up the language like I'd known it from the day I was born (I spent 7 years at school learning Italian!) and I'd happily eat gelato every day for the rest of my life. But when you can't have tomatoes, your pasta loving life gets seriously limited. When I found out I couldn't eat tomatoes, I went from eating tomato based pastas at least twice a week to only being able to eat creamy sauces. I drooled over everyone else's Spaghetti Bolognese, Marinara or Napoletana sauces and longed for the day when I could eat them again.... but then I started making Nomato Sauce. All of a sudden I could eat tomato style sauces once again without curling up in a heap of pain an hour or so later. When I came up with our Ultimate Nomato Sauce Recipe, those pasta dishes were taken to a whole new level. This is the closest alternative to tomato sauce and it makes the most delicious pasta sauce. It's so good that even Jesse loves it (and he hates beets but doesn't realise they're in there, haha!) - especially because it doesn't give you heart burn like tomato based sauces often can. 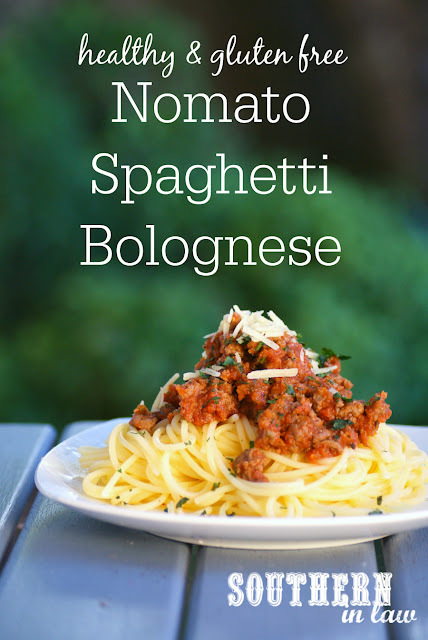 This Nomato Spaghetti Bolognese Recipe is a healthy, allergy free version of an Italian classic that you need to try! 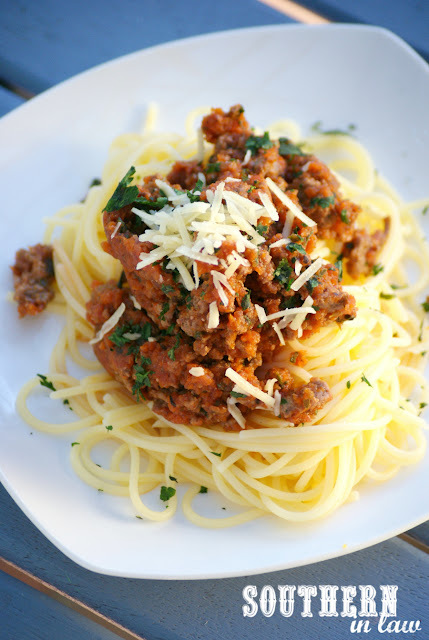 Whether you spell it bolognese or bolognaise (which is the french version - but apparently that's the way most Australians spell it), it's always a delicious dinner option! Dried oregano, garlic salt and pepper, to taste. In a medium saucepan, saute your beef until browned and cooked through, breaking it up into smaller pieces. 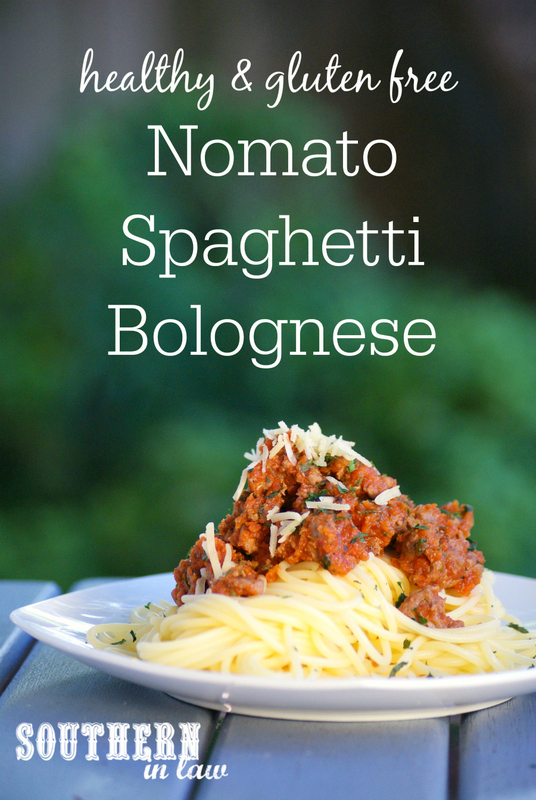 Add your nomato sauce and season to taste with your fresh and dried herbs, salt and pepper. If your sauce is a little too sweet for your liking, add in some beef stock powder or a small amount of gluten free vegemite (we use either Mighty Mite or Ozemite) to add more of a savoury flavour. Reduce your sauce to your desired thickness or add a little water to thin the sauce out and serve over your cooked pasta. Enjoy immediately or store in the fridge (either on its own or mixed with your pasta) to enjoy later. This sauce will keep for 2 or so days in the fridge and can also be frozen. *If using crushed tomatoes, add 2 or so tablespoons of diced onion and 1 clove garlic. Saute this before adding your beef. But tell me, do you ever feel like you should come from another country/nationality? And when cooking dinner, do you stick to a recipe/measurements or do you go by taste/smell?